We are done with the winter Olympics and now are looking forward to the Oscar's entertainment. As we saw in the previous puzzle, the most interesting stuff happens away from the main arena and escapes the media attention:) And what do we have on the margins of the Oscar ceremony? 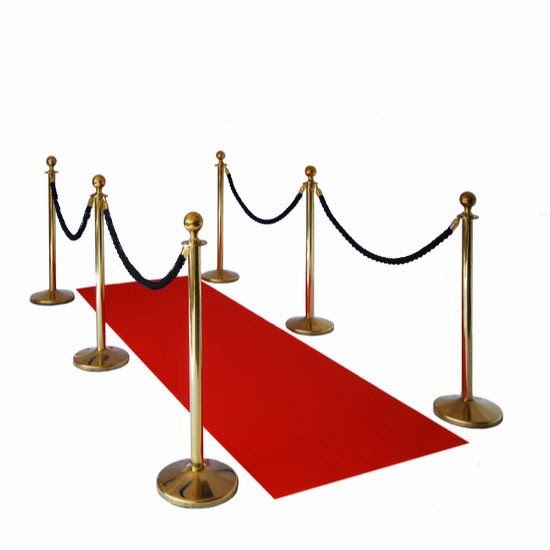 VIP ropes and poles that guard the Red Carpet attendees, of course. This a puzzle about two poles, 5 feet high each, and a rope connecting these poles. The rope is 6 feet long and at its lowest point is 2 feet above the ground. The question is: how far away are those poles? This puzzle came from my son's friend Adam. Thank you! I knew this was a catenary, and managed to dig up a formula for "D". But, when I went to plug in the numbers, I quickly realized that the equation would reduce to zero! Did I do something wrong? Then I took another look at the picture. The poles are five feet tall and the "sag" is two feet off the ground. That means that the distance from the top of the poles to the bottom of the "sag" is three feet - the mid-point of the length of the rope. This means that half the rope is "used" dropping from the right pole to the low point and half the rope is "used" going up from the low point to the left pole. The only way that happens is if the two poles are touching - i.e. are zero feet apart. I *DID* use the equation right! No math needed. The poles have to be next to each other (?=zero). This puts the rope hanging straight down. Each side is half of the 6 feet, so they reach to 2 feet above the ground. The poles are 0 ft. away from each other! For a 6-foot rope to drop 3 feet in height and then rise 3 feet in height, there is no slack left over to create any horizontal distance. Of course, I did plenty of reading on catenaries and hyperbolic cosines before realize the problem was essentially impossible! What a deep problem this week. The problem involves the catenary. A catenary is a cable or other flexible wire like structure that is suspended from each end. It is not quite a parabola which is what it looks like, although we can make an approximation (see below) for a parabola. The most famous catenary I know is the one in St. Louis. See the article below. More examples can be looked up by googling catenary and clicking on pictures. There are many. I will not show what algebra I used to reduce this, but even after doing this the equation was far too complex to solve easily. However, Wolfram Alpha always comes to the rescue in such cases. Here is the graph and other details. The solution is 4.21 feet according to Wolfram. So the distance is 4.21 feet across, which is close enough to the catenary answer. I don't remember studying this in school. I know it has something to do with the function of the parabola. I don't know the formula though. I did a very rough estimate. I made an imaginary triangle of 5' - 2' = 3' for height. The "hypotenuse" is half the length of the rope length of 6' divided in half = 3' plus I subtracted another foot since it sagged to equal 2'. This is not exact but should be in the ball park. The poles are next to each other. The rope connecting the poles, hanging 2 feet above the ground, covers the length of 3 feet for each pole from the top (6 feet in total). As the length of the rope is 6 feet and the constraint that it has to be suspended 2 feet above the ground, the poles have to be placed side by side. In this problem we know y (5 feet) and a (2 feet) and are solving for x. I solved it using Excel and plugging in possible values for x until I got the right value for y. This seemed much easier than solving it directly. My estimate of x is 3.135 feet, which means that my estimate of the distance between the two stands (2x) is 6.27 feet. I thought friends you know me by now. This blog is not about very confident math majors solving complex math problems but about simple math that anyone could do. If it looks too complex - there is a trick somewhere! Plus, remember that is came from my son's friend. And 13-year olds would think it is fun and share only if it is cool indeed. The rope is 6-feet long and is hanging symmetrically, so 3 feet on the right part and 3 feet on the left. Note that 5-2=3 and this is the height of the rope curve. The only way 3-feet long rope curves inside a 3-feet long space is if it is a straight line. Rope just falls down 3 feet, then goes up 3 feet to the second pole. Poles are right next to each other! A puzzle point for anyone who dared to tackle it and came up with either solution and answer. It makes you wonder why the formula didn't give a bogus result somewhere. I like the fact that we get a good laugh out of math. Problem is, few understand what the joke is. I'd almost like a tee shirt of this one. Way to go Adam and Maria. Way to go Adam and Maria. Anything that provides a laugh is a good thing. Trouble is, few people would get the joke. It almost requires a tee shirt. A followup comment for those who used catenary formulae and got the wrong answer. It is normally a good idea to take a step back and look at your answer to see if it makes sense. For example, given that the rope is only 6 feet long, saying the poles are more than 6 feet apart doesn't meet the "step back" test. Just something to think about in those everyday math problems. Let us approximate the half of the rope to a straight line. This results in two right angled triangles with both the hypotenuse & vertical sides measuring 3 feet each, which is not possible. Therefore, the rope has to be vertical making the poles touch one another...!! !